Sapphire: We are representing a selection of good quality Australian Sapphire faceting rough from the central Queensland gem fields. This mine is producing Blue, Blue-Green, Green and Parti-Colour and some Yellows (as well as large quantities of Black). It will come as no surprise that there is a vast range of possible colours within these categories, so it�s somewhat difficult to say with any authority what the eventual finished cut colour will be when inspecting the rough material. A lot depends on where the colour concentrations are in the stone and also what shape is chosen and which type of cut and cutting angles are used, as well as what orientation of the rough the cutter chooses. It is especially difficult when you get some of the Parti-Colours. They could be blue/green/yellow or could be a mix or could be one tone dominates. The greens come in many different shades and also range from lighter to darker. 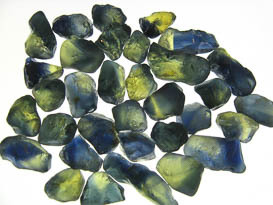 The Blues are mostly the darker intense blues typical of Australian Sapphire. The Blue-Greens are similar but vary in which tone has the dominant colour or could be an even mix depending on orientation. The Yellows are much harder to come by and we don�t stock these, but if you are interested let us know and we can make some enquiries. Most importantly this rough is guaranteed to be natural, untreated and unheated and is coming to you directly from the mine producer with a little push on from us. However this rough is somewhat unusual in that coming from a miner in Australia they are subject to all the environmental, safety and employment regulations that are usually absent when buying from most other sources in Africa, India and Asia. By buying this rough you are assured that its fair trade all the way and also, you can in turn guarantee your customers buying the finished gem the same thing. 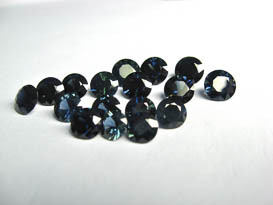 We are working on building up some business with this supplier since we know as a cutter how hard it is to get untreated gem material and also how hard it is it to get Sapphire faceting rough in good quality in decent sizes. We have been cutting this ourselves and have also seen the results other cutters are getting, so we feel very confident that you will get very good value for your money. Very few facet rough suppliers have access to this size and type so our goal is to manage this in such a way that not only you the cutter gets a good deal, but also that the mine producers gets some sell through on their stock. We have added a small margin only, with the objective of getting some momentum built. With this in mind you can order knowing that the quality, as in the cleanness, clarity and general cuttability, is well graded and consistent. With the items that have been cut so far the yield has been averaging 25 to 33%. Obviously you will know of course that to get this sort of yield one needs to follow the shape of the rough. Below we have set up three line items showing samples of the rough for each type and also some of the cut stones that we have achieved. 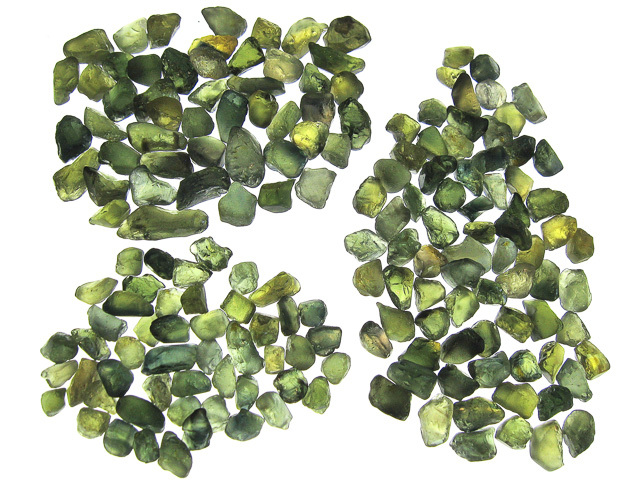 DISPLAY ONLY�.This line shows examples of our Green Sapphire facet rough plus cut stones to show the range of colours you could expect when this is cut. As you can see a wide range and very difficult to predict with any certainty what you will get, but could be anything from light to dark, yellowish green to lime green to blue green to Peridot like green to Tourmaline like green. 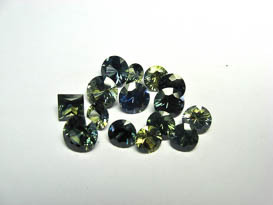 Out of the 35 stones in the cut sample there were only 3 pairs so keep that in mind if you are looking to cut to order. 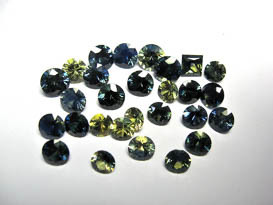 You will drive yourself crazy if you are looking for a specific tonality�fancy coloured sapphires are like your children� all different probably but you gotta love em all. DISPLAY ONLY�.This line shows examples of our Parti Sapphire facet rough plus cut stones to show the range of colours you could expect when this is cut. As you can see there is a very wide range and it is almost impossible to predict what you will get. Could be anything from light to dark, yellowish green to blue green to blue yellow to yellow blue and every possible permutation you could think of. On top of the two or three colour combinations together, some rough will cut so it looks just blue or just yellow. Where the colour sits in the crystal and what shape you cut will determine what results you get. Sometimes the rough has a mind of its own. Out of the 28 stones in the cut sample there was only 1 pair so keep that in mind if you are looking to cut to order. You will not be happy if you are looking for a specific tonality or combination or separation. 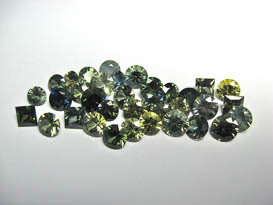 As with the green Sapphire analogy to our children... not programmable so assume every one will be different. DISPLAY ONLY�.This line shows examples of our Blue Green Sapphire facet rough plus cut stones to show the range of colours you could expect when this is cut. As you can see a much narrower range than the Green and Parti Sapphire rough and the differences are more to do with firstly whether it�s blue or green that has a slight tonality edge and secondly how saturated the colour is. Remember that Australian Sapphire is known for its darker tones in the blues so if you are looking for a light Ceylon type blue it�s highly unlikely that you will get it, especially when you get up into any size over 3mm. It�s up to personal taste of course whether you like light and bright and sky blue or a rich dark blue. Personally I like both but it�s almost impossible buying lighter Sapphire rough. You can of course get lighter tones in the Montana Sapphire but hard to get larger sizes in the rough and you can sometimes get Nigerian or Madagascan rough but that�s the Wild West and good luck with that. 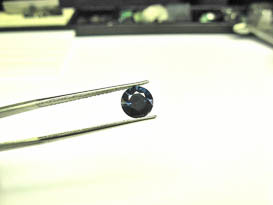 Australian Sapphire purchased though us has the benefit of sizes up to 20 plus carats being available, consistent grading, buying from someone who knows what they are doing, and fair pricing. Green Sapphire facet rough 10.10 carats and measures 19X10X4 mm. Clean and looks good for good yield. Bit of a challenge depth wise and might be a good candidate for a fantasy cut pavilion. Obviously would be suited to a marquis shape and colour looks like it will be a bluish green. This is from Central Queensland Sapphire fields and is guaranteed untreated and unheated. Standard return policy is can be returned within 2 weeks of delivery as long as has been unworked and shipping charges are nonrefundable. 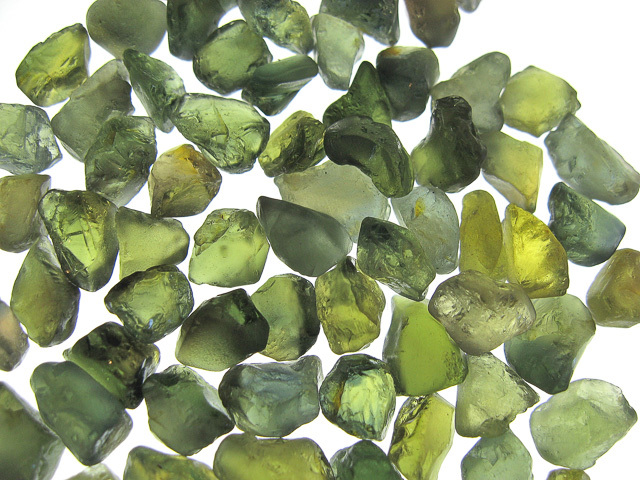 Green Sapphire facet rough from Australia. Weighs 6.48 cts and measures 10x7x5 mm. Nice colour with a touch of blue. 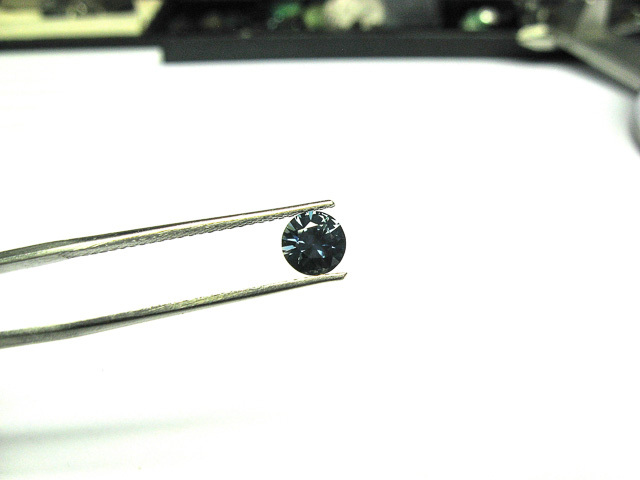 Looks clean for a good yield, maybe a 9x7 oval with a bit of care. Natural untreated and unheated. We have included a photo of some of our cutting results so you can see the colour range possibilities. 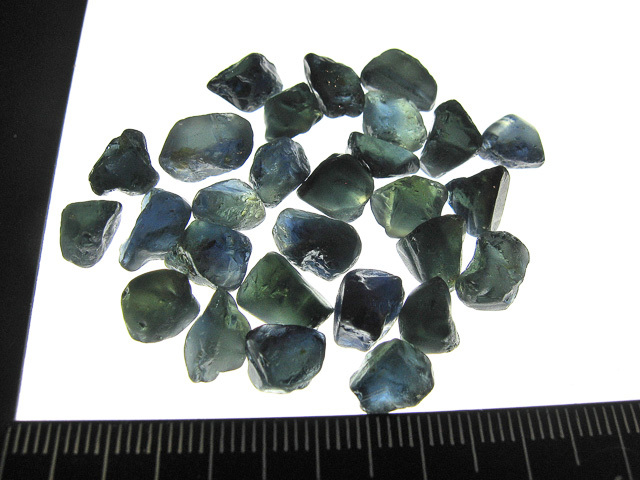 Parti Sapphire facet rough 8 piece lot from Australia. 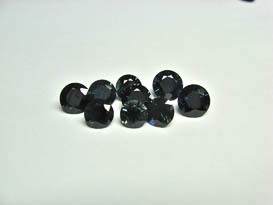 These weigh 27.65 cts and measure from 6x5x4 to 7x6x5 mm. Aveage weight is 3.45 carats Look clean and should yield well. Good interesting mix of colours so should be good yield and we have been getting 4.75 to 5.75 mm on this size. This is natural, is untreated and not heated. Parti Sapphire facet rough 6 piece lot from Australia. 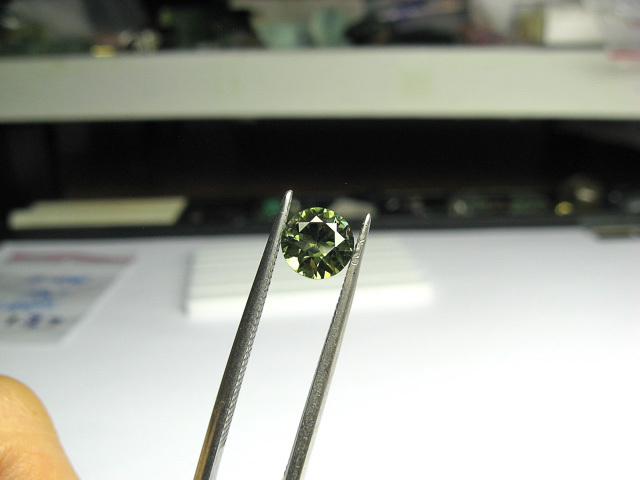 These weigh 17.28 cts and measure from 6x5x4 to 10x5x4 mm. 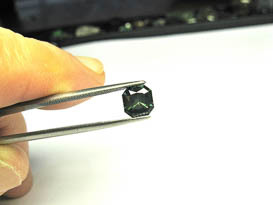 Average weight is 2.88 carats. Look clean and should yield well. Good interesting mix of colours so should be good yield and we have been getting 4.5 to 5.5 mm on this size. This is natural, is untreated and not heated. 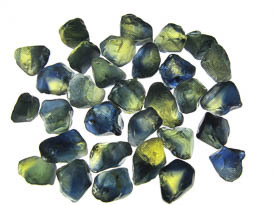 Blue green Sapphire facet rough from Queensland in Australia. 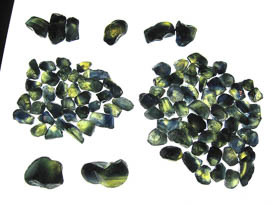 Six pieces with a total weight of 20.75 carats. This is untreated and unheated. Individual piece size 10x5x4, 8x4x3, 10x5x6, 7x6x3, 7x4x3 and 10x5x3 mm. These all appear to be clean internally but obviously certain amount of preforming will be necessary. All show varying amounts of green and blue. Average yield on this size should be approx 0.70 carat depending on what shape you cut�(could be more if you follow the rough shape. We tend to get 4.75 to 5.25 when we cut rounds from this size. The finished colour varies in the blue green range with more blue than green.